Encounters with the Archdruid. New York: Farrar, Straus and Giroux, 1992, c1971. 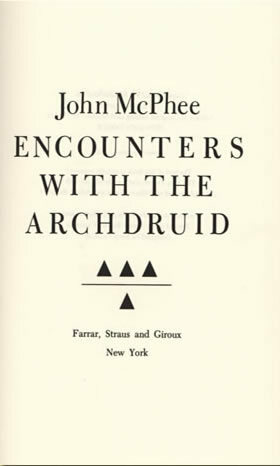 In this work, McPhee describes the encounters between the "archdruid" David Brower (1912-2000), ardent conservationist and founder of Friends of the Earth in 1969, and a dam builder, resort developer, and mineral engineer. Brower would continue to lead environmental action, founding the Earth Island Institute in 1982, and constantly advocating for the environment until his death in 2000. John McPhee, a Pulitzer Prize-winning writer of non-fiction, was awarded an honorary degree from Lehigh in 2010. What did Conservation mean at Lehigh?